Host Aida Mollenkamp is on a mission: to discover and celebrate the absolute masters in independent food production around the USA. These are FoodCrafters, award-winning makers of gourmet cheeses, chocolates, bread and a thousand other delicacies. Rock stars in the foodie world, they're obsessed, compulsive entrepreneurs with a single focused passion: to create the ultimate flavors and tastes. Going behind the counter, Aida rolls up her sleeves and digs in, revealing both how these signature treats are made and what it took to bring them to the table. For anyone who ever cheered on the little guy, FoodCrafters is a behind-the-scenes look at how these food entrepreneurs turned the American Dream into a tasty one. Now you can stream the entire first season of FoodCrafters for free without logging in. 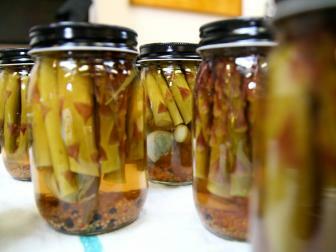 Check out all the tart and tangy goings-on at this small-batch, artisanal pickling company. Get details on Aida's list of markets, farms, bakeries and more from the show. Start with the basics, Aida suggests. Her picks include the following building-block ingredients.